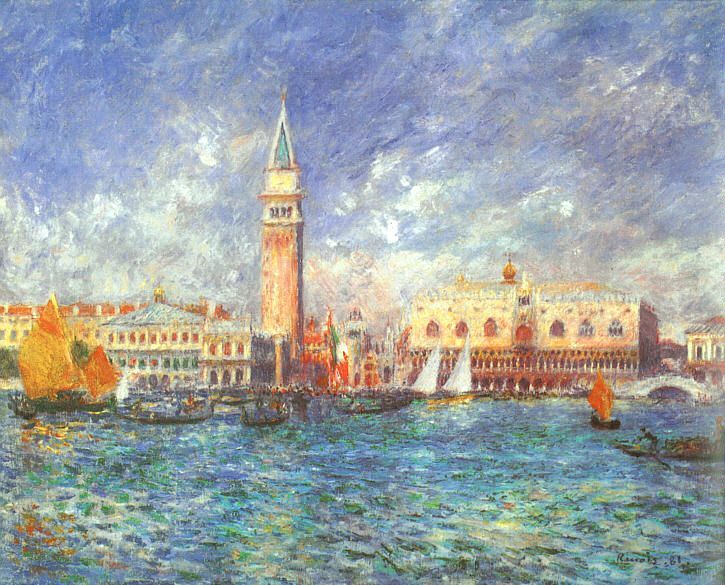 Pierre-Auguste Renoir (1841-1919), Doge's Palace, Venice (1881), oil on canvas, 54.5 x 65 cm, Clark Art Institute, Williamstown, MA. Wikimedia Commons. The great majority of landscape paintings try to depict the motif which the artist can see, with a fairly direct form of artistic vision. It is very hard to gain insight into how direct that vision is. Comparison with photographs is often unhelpful, as what the camera captures is much more limited than the experience or ‘sensations’ of the artist. The best way of confirming that is to study a photograph of a motif against the motif itself (not afterwards as is so commonly done): whilst the photographic image will inevitably appear accurate, it will be much more limited in its dynamic range (the tonal range captured), detail (resolution), and more besides. The painter often attempts to represent more than the merely visual in a painting. In the fierce light and heat of the Midi, for example, they may want to convey additional sensations, as explained by Cézanne. Unless you manipulate a photographic image, there is no way that image will convey the same sensory impressions. If you are able to paint and take aesthetically pleasing photographs, you will know well the differences in subject, composition, and rendering between good paintings and good photographs. So the only useful way of gaining insight into this type of artistic vision is to compare the paintings made by different artists of the same motif. The only location which has a long and rich history as a subject for painting is Venice, and of the sites in Venice which are frequently painted, Piazza San Marco (Saint Mark’s Square) is probably the most frequently painted. This article is thus a historical exploration of paintings of that motif: again, this is not something that I have seen attempted elsewhere, and certainly not on this scale. There are a few important artists who did paint in Venice but for whom I have been unable to locate a copyright-free image of any attempt to paint the Piazza. I have in those cases chosen paintings showing the closest motifs, to give an idea of their approach to similar motifs in Venice. If you know of other paintings of the Piazza which could be included here, please let me know so that I can add them. If you have ever been to Venice, seen the city in films, or in photographs, you will be familiar with this largest open area, surrounded by ancient buildings. There is a good account of its geography and history on Wikipedia. 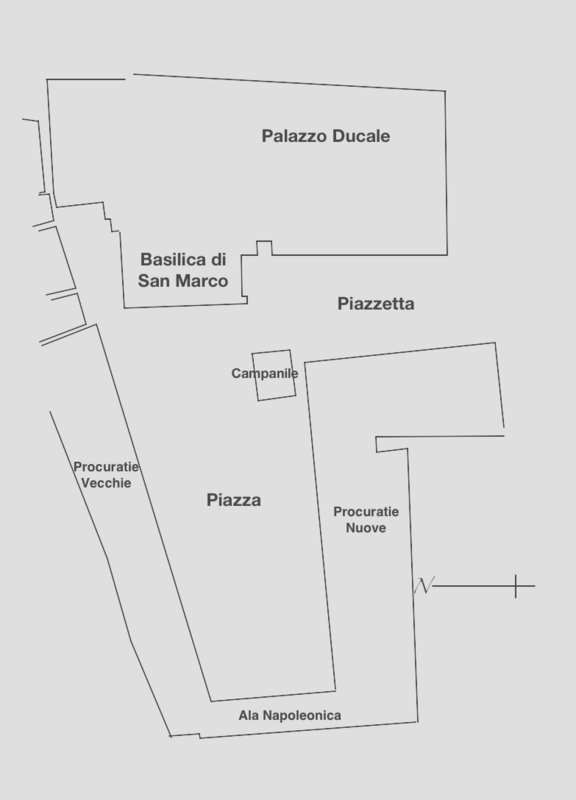 Outline plan of Piazza San Marco, Venezia, as in 1831, after Quadri-Moretti (via Wikimedia Commons). You may not be so aware that the Piazza is not rectangular, and is not even strictly trapezoidal. Its eastern end, dominated by the distinctive Basilica and the high Campanile tower, is broader than the other end (with lower buildings dating from Napoleon’s time). Neither are the two other sides, the north and south sides, equal in length or height. 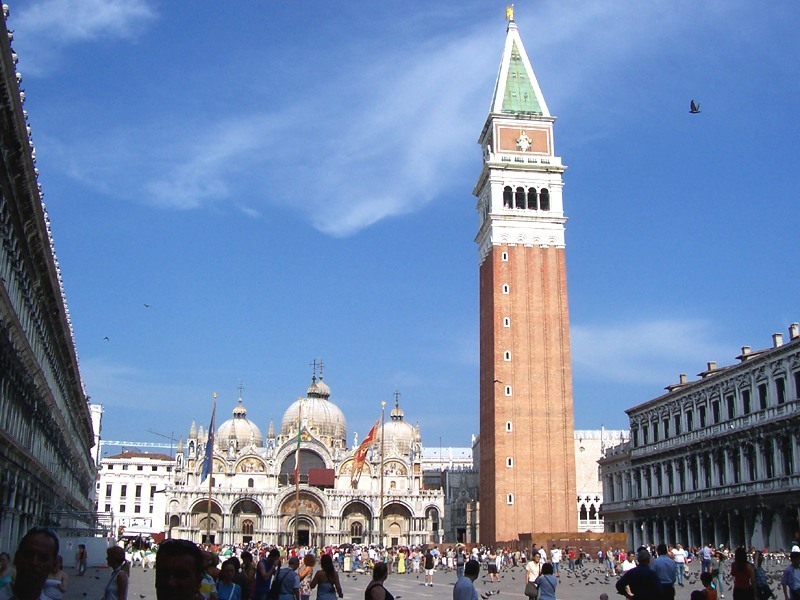 As a landscape (or cityscape) painting, it presents another major problem: the Campanile tower is high relative to the frontage of the Basilica. If you place your canvas in the ‘portrait’ orientation to accommodate the height of the tower, then it will lack the breadth needed to show the north and south sides of the Piazza. If you choose the ‘landscape’ orientation to encompass those sides, then the canvas will lack the height to show the Campanile. This photograph shows how difficult it is to accommodate three sides and the tower, but hopefully will remind you of the buildings that many of the paintings are intended to depict. Although the view has changed in detail since the erection of the first Campanile in 1499, its general layout has remained remarkably similar over the last 500 years, another important factor in my choice of motif. Gentile Bellini (1429–1507), Procession of the True Cross in Saint Mark’s Square, Venice (1496), oil on canvas, 367 × 745 cm, Galleria dell’Accademia, Venice. Wikimedia Commons. Gentile Bellini’s (1429–1507) Procession of the True Cross in Saint Mark’s Square, Venice (1496) is the only painting which is believed to have been completed before the first Campanile, although there is a high building at its right which might represent the first tower during its construction. Its structural focus is the frontage of the Basilica, and its centre of attention and activity is the huge procession, in particular the True Cross sheltered under its canopy just to the left of the centre foreground. As a Renaissance work, its main concern is accurate projection and constructing the resemblance of reality. Although its figures are not the flat cut-outs typical of earlier paintings, they do not quite achieve the impression of depth. The composition is also carefully aligned on the centre of the main entrance to the Basilica, to simplify the perspective projection. Using what would be now termed a panoramic format, it is slightly too shallow to encompass the entire domes and superstructure of the Basilica. However it is a magnificently detailed depiction of a technically challenging motif. Giorgione, circle of (c 1477/8-1510), The Virgin and Child with a View of Venice (The Tallard Madonna) (c 1500), oil on panel, 76.7 x 60.2 cm, Ashmolean Museum, Oxford. WikiArt. Attributed to Giorgione (c 1477/8-1510) or his circle, The Virgin and Child with a View of Venice (The Tallard Madonna) (c 1500) is an excellent example of a landscape contained in cameo view, through the window. 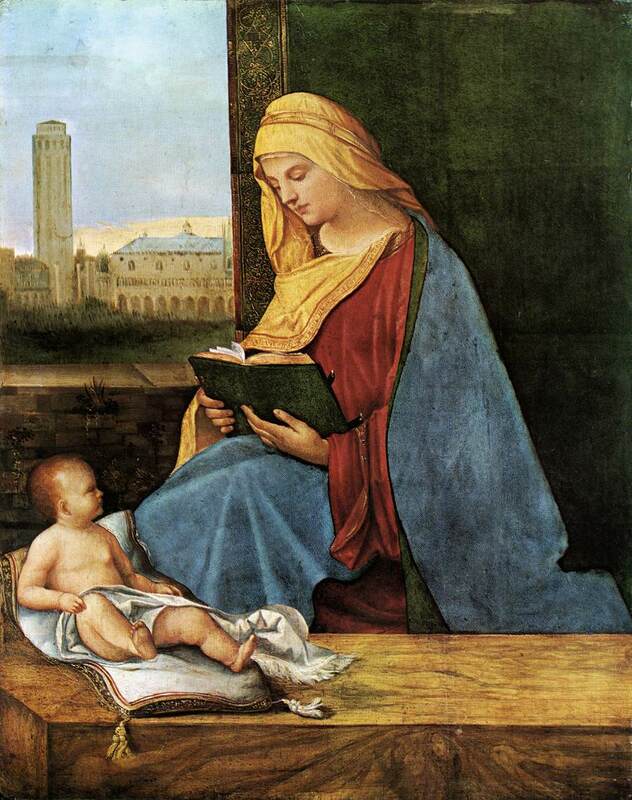 The Virgin Mary and infant Jesus (who never of course came anywhere near Venice!) are seen with a view through the window of the south-eastern corner of the Piazza, during completion of the first Campanile, when it still had a flat roof (which was in place between 1489-1511). Surprisingly the painter does not take the opportunity to show the frontage of the Basilica. There is also the odd contradiction that the Basilica and Piazza as a whole are dedicated to Saint Mark, who was martyred in about 68 AD in Alexandria. Thus this cameo landscape appears to be an artistic device to link the subjects of the painting with Venice, even though the link is geographically impossible and highly anachronistic. Giovanni Antonio Canal (1697–1768), known universally as Canaletto, was the first and most prolific specialist in Venetian scenes. I have chosen three of his many views of the Piazza as broadly representative. The first, Piazza San Marco (1720), presents the straight classical view of the Piazza, from the middle of the western end, looking straight at the Basilica. 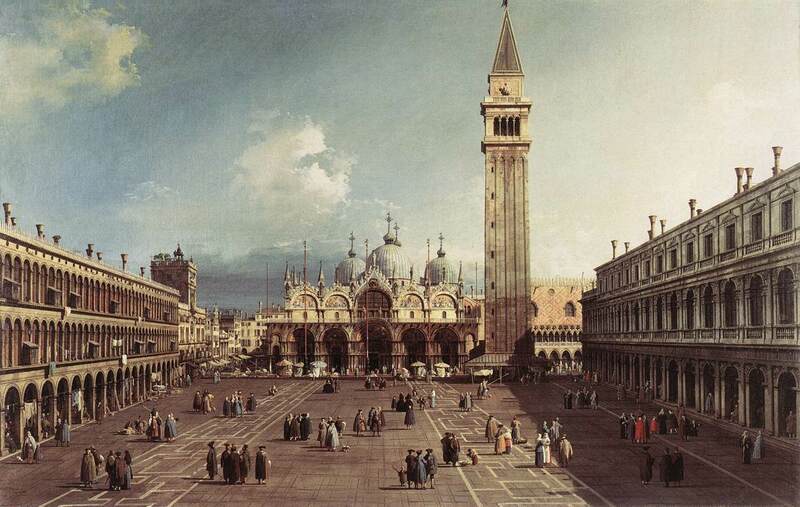 However, recognising the imbalance that would produce, Canaletto has angled the view slightly towards the Campanile, putting the centre of the Basilica to the left of the midline, and the Campanile slightly to the right. This brings the higher buildings on the right (the south side) to greater prominence, which is corrected for by placing the north side in full sunlight (as it would be, with the sun to the south), and with a profusion of bright awnings along its length. Although Canaletto was never afraid to make ‘adjustments’ in his paintings to enhance their aesthetics, the markings in the paving of the Piazza suggest that this view is quite faithful to actual appearance. He has also populated the Piazza with colourful figures as staffage, without any indication of an ‘Advent Calendar’ approach. 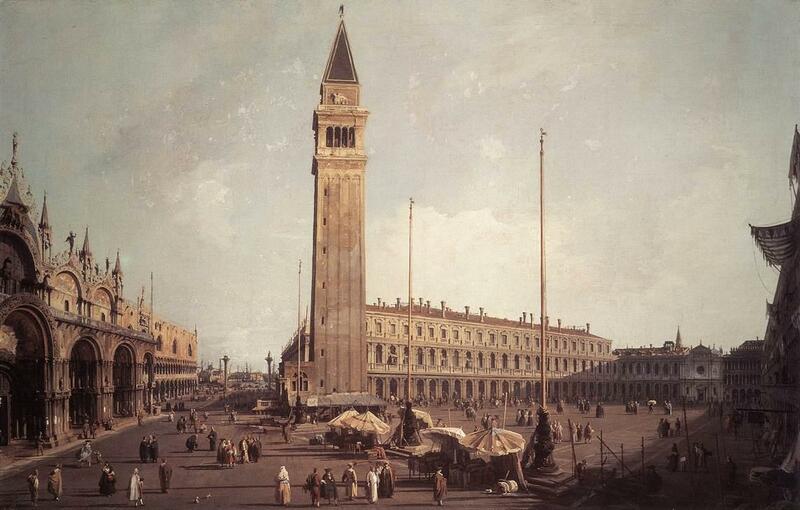 Painted about a decade later, his Piazza San Marco with the Basilica, Venice (c 1730) is almost identical, but with some interesting differences (other than the new buildings shown to the left of the Basilica). The sun is higher in the sky, shortening the shadows cast by the south side of the Piazza. The south and north sides appear less balanced, in the absence of awnings, and the north side (left) is at a more marked angle to the marks in the paving, making the east side (that of the Basilica) significantly longer. The Campanile also has an additional two slit windows up its height, and reaches to the very top of the canvas, so appears slightly higher. These differences confirm that one or both paintings were not as accurate depictions as might appear. Michele Marieschi (1696–1743), The Procession in St. Mark`s Square in Venice (c 1740), oil on canvas, dimensions not known, State Museum of Arts of Uzbekistan, Tashkent, Uzbekistan. Wikimedia Commons. Obscure relative to Canaletto, Michele Marieschi (1696–1743) painted The Procession in St. Mark`s Square in Venice (c 1740) another decade after the later Canaletto, from a very similar point and showing an almost identical view. Unfortunately the only digital image available is not of comparable quality (I suspect the colours, in particular), but its details are much closer to the later Canaletto (c 1730) rather than the earlier (1720). 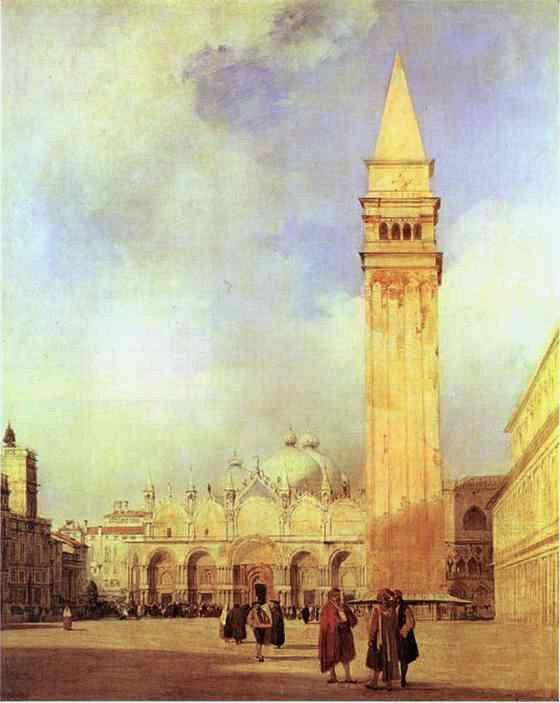 If you try to locate an image of this painting, you are likely to find it inverted, with the Campanile appearing on the wrong side of the Piazza: I have corrected that in the image above. Towards the end of his career, Canaletto painted a very different view, in his Piazza San Marco: Looking South-West (1755-9). Here the viewer is at the opposite end of the Piazza, to the north-west of the end of the Basilica, and looks directly at the Campanile, and out into the Piazzetta behind and to the left of the tower. With the irregularity in the shape of the Piazza, this gives the appearance of being projected using a wide-angle lens, and is remarkably early for such lens effects to be seen in a painting. It has been suggested that Canaletto made extensive use of the camera obscura to construct his paintings, which could explain that, although given the inconsistencies between his paintings and the reality of Venice, that might seem unlikely. Here the sun is in the north-west, with long cast shadows, implying that it was a summer’s evening. The Campanile is shown with the correct number of slit windows, but being much closer to the viewer in this case, it may well be depicted rather shorter than it should have been, in order to fit it into the canvas. Francesco Guardi, Piazza San Marco in Venice (c 1770), oil on canvas, 50 x 85 cm, Nationalmuseum, Stockholm. Photo by Szilas, via Wikimedia Commons. After Canaletto, the next most prolific painter of views of Venice was probably Francesco Guardi (1712-93). 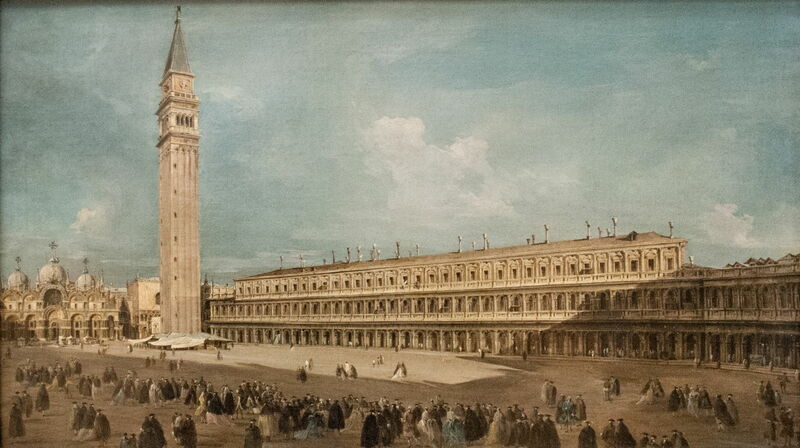 In his Piazza San Marco in Venice (c 1770) he opts for a ‘panoramic’ canvas, and places the viewer at the north-western corner of the Piazza, to show the Basilica, Campanile, and the whole of the southern side of the Piazza. With the sun low in the north-west, this too was a summer evening scene, putting all those buildings in sunlight. This painting is dominated by the tower and the higher, newer block of buildings along the south side, giving it a formal linear air with deep perspective projection. The curved domes and arches of the front of the Basilica are distant and subjugated, and by placing the Campanile as deep as possible, he has accommodated its height within the relatively shallow canvas. Although as asymmetrical as possible, the composition balances the perpendicular of the tower against the advancing terrace of the Procuratie Nuove. 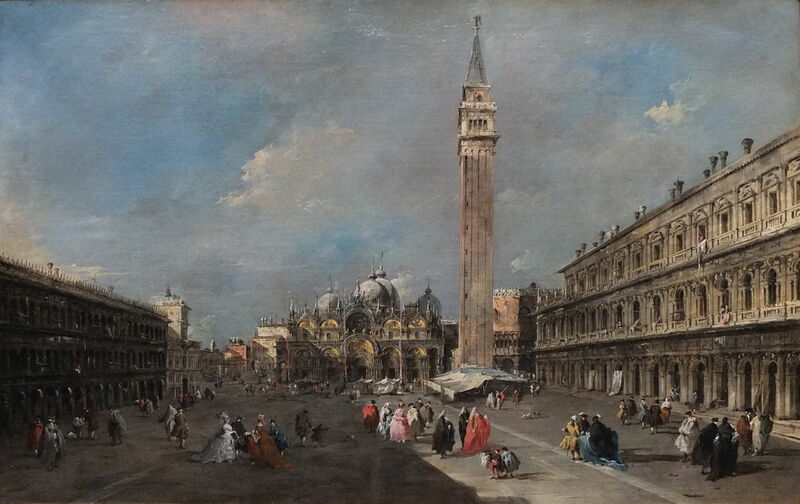 Just five years later, though, Guardi’s The Piazza San Marco, Venice (c 1775) marries the more conventional and classical view with a marked change in his painting style. The highly-finished precision of the previous paintings (with the exception of the cameo view of Giorgione, perhaps) has been replaced by looser application of paint, allowing the marks made by the brush to be seen. This is most obvious in the Basilica, which has lost its previous rigorous rectilinear appearance. The flagpoles in front of it appear less ‘perfect’, and its multitude of aerial spires and decorations has become an irregular jumble. Marks are most visible in the various fabrics, such as the clothing of the figures in the Piazza, awnings and other staffage, and in the clouds above. There is nothing to suggest that it was painted plein air, and given the size of the canvas and the intricate detail shown, it was almost certainly the product of many days work in the studio. Despite this radical departure in facture, the composition follows the traditional approach: the view is from the middle of the western end of the Piazza, with the centre of the Basilica and the Campanile straddling the centreline of the painting. The sun is again in the north-west, setting the time to a summer’s evening. Richard Parkes Bonington (1802-28), Venice: The Piazza San Marco (1827-8), oil on canvas, 99.4 x 80.3 cm, Wallace Collection, London. WikiArt. In his tragically brief life, Richard Parkes Bonington (1802-28) produced some remarkable paintings, and his unfinished Venice: The Piazza San Marco (1827-8) shows signs that it might have been among his best. At the time that he started this, Canaletto’s work was popular and able to command good prices from collectors, and he was perhaps aiming for the same market. Bonington’s composition is one of the few since Giorgione’s to recognise the problem of incorporating the height of the Campanile, and attempt a resolution which combines proportion and visual effect. The viewer is low down on the south side, gazing up into the sky. The tower, gently distorted by its projection, occupies the right, with the lower Basilica making a formal right angle at its foot. This spares us from the staffage needed to decorate large areas of pavement in the Piazza, which is relegated to the lowest eighth of the canvas. He painted an earlier watercolour to check that this would work. The buildings have a golden glow from the setting sun, here low in the north-west (again), but those colours would undoubtedly have been enahnced by rich glazes, had Bonington lived long enough to complete it. It is baffling that, when sold the year after his death, it fetched a mere £18. Jean-Baptiste-Camille Corot (1796-1875), Venice: Gondola on the Grand Canal (c 1835), oil on canvas, 41.3 x 29.2 cm, Private collection. WikiArt. 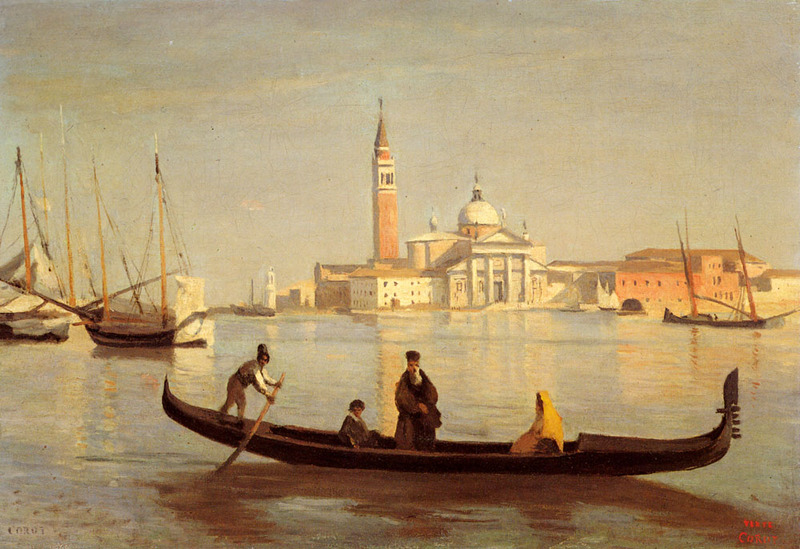 Better known for his extensive views of Rome and its surrounds, Jean-Baptiste-Camille Corot (1796-1875) painted some fine oil sketches (presumably plein air) in Venice, including a distant view of the Church of San Giorgio Maggiore (later shown by Monet), in Venice: Gondola on the Grand Canal (c 1835). Most obviously different is its limited level of detail, although this particular view contains many buildings and boats, and may have been the result of several sessions in front of the motif. Seen in morning light, with the sun off to the right, in the south-east, Corot’s informal composition adds to the spontaneous appearance. However he has been careful to render the reflections softly but accurately; each of the edges shown in the water has been aligned to its original. This and the later Guardi make for an interesting comparison. Guardi’s studio painting makes its marks more obvious, although it was undoubtedly painted over a much longer period; the marks in Corot’s plein air are softer and less brash, although it was probably painted in just a few hours in front of the motif. Joseph Mallord William Turner (1775-1851) (see here) painted extensively in Venice, but I have been unable to find any accessible work which shows a view of the Piazza. Sadly his Juliet and her Nurse (1836), which shows a unique aerial view of the Piazza from the south-western corner, by moonlight, does not appear to be freely available. 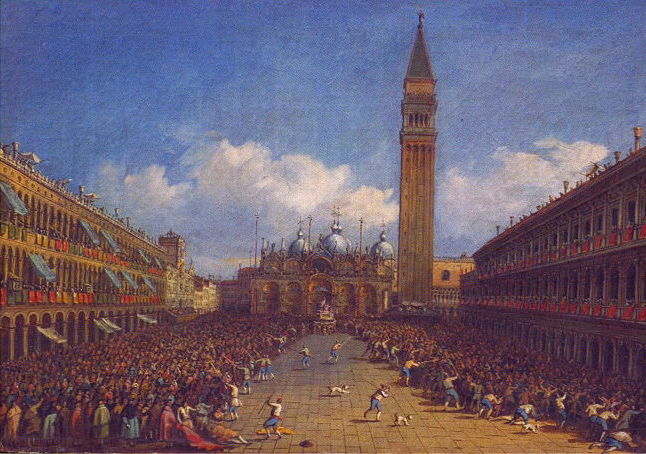 Venice, the Piazzetta with the Ceremony of the Doge Marrying the Sea (c 1835) shows the Piazzetta from the south, with the Campanile on the left, and the unmistakable domes of the Basilica in the centre. JMW Turner (1775-1851), Venice, the Piazzetta with the Ceremony of the Doge Marrying the Sea (c 1835), oil on canvas, 91.4 x 121.9 cm, The Tate Gallery, London. WikiArt. Just as Turner’s view of the tower and Basilica is unusual, so his depiction is remarkable, particularly for its time. The buildings, figures, even boats in the foreground appear to have been formed in haste, and without detail. Even the most detailed figures on the boats in the foreground are made up of notional marks and patches of colour. Despite this vagueness and lack of detail, which suggests that the scene was bathed in mist, this painting is rich in light and colour, and conveys what might best be termed a vivid impression of crowded ceremonial. 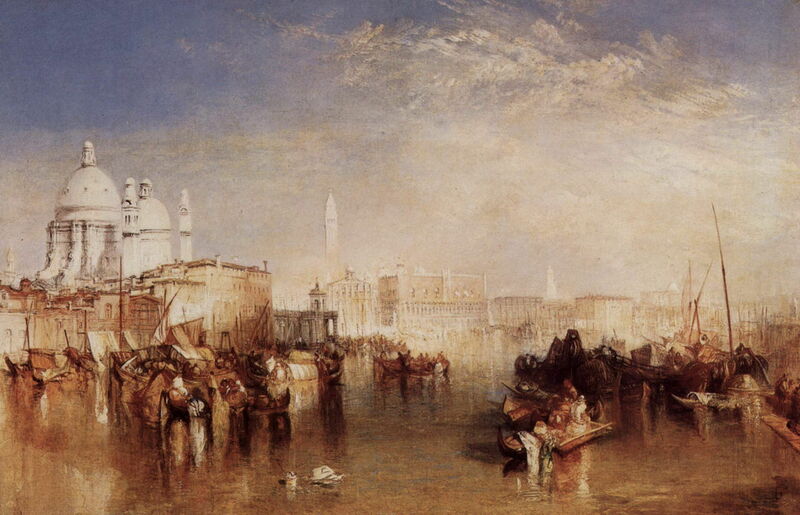 JMW Turner, Venice from the Giudecca (1840), oil on canvas, 61 x 91.4 cm, Victoria & Albert Museum, London. WikiArt. 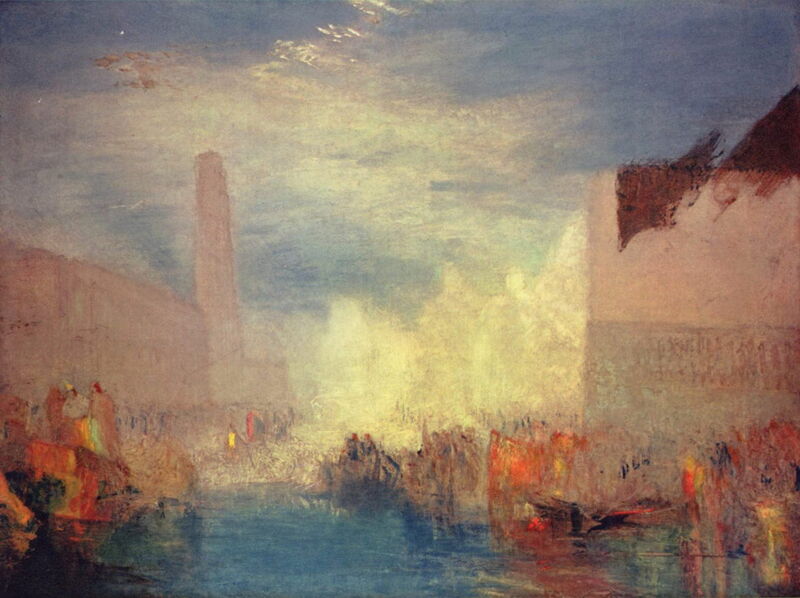 Turner’s Venice from the Giudecca (1840) is almost as radical in its approach. The viewer is again on the water, this time rather further from the Campanile, which dominates the skyline just to the left of centre. Instead of the rich colours of ceremony, this work is rendered entirely in earth colours, with blue for the sky. Minimal architectural details are given to provide cues to the forms and identities of the buildings. The foreground is crisper and richer in detail, showing all the paraphernalia of trade and life in boats, and their reflections in the water. However it is hard to discern exactly what is being shown; again we are given an impression, here with ample detail, but insufficient visual cues to enable precise identification. Turner carefully controls the effects. Above, the clouds are formed from hazy areas and coarse daubs of white paint, their marks left clear to see. Pierre-Auguste Renoir (1841-1919), Doge’s Palace, Venice (1881), oil on canvas, 54.5 x 65 cm, Clark Art Institute, Williamstown, MA. Wikimedia Commons. The first of several Impressionists to visit Venice, Pierre-Auguste Renoir (1841-1919) chose a view of the Piazzetta from over the water, further back than Turner’s, in his Doge’s Palace, Venice (1881). The tops of the roofs follow the (horizontal) centreline, with the Campanile reaching well above that, and various boats below the band of buildings. Renoir’s canvas has an aspect ratio of 1.24:1, considerably more square than the golden ratio, and far from the panoramic proportions that might be expected for such a shallow view. This left him with substantial bands of largely blue sky and vacant water, above and below the buildings and boats. The reason for this choice is unclear, and the vague areas of colour shown in the bottom band of uninterrupted water cannot represent reflections. Although this painting makes visible abundant brushstrokes and appears very loose in its facture, Renoir has included a lot of quite fine detail, such as the individual arches and columns for the whole of the front of the Doge’s Palace, even some of the tracery in the windows above. This would have required multiple sessions in front of the motif, or more probably several days spent in a studio. Colours are bright, and broad areas such as the sky and water made up from strokes of unmixed colours, to give them a coarse chromatic texture which is typical of Renoir’s style at the time. All these effects contribute to the overall impression of spontaneity and speed of execution. The American Impressionist John Henry Twachtman (1853-1902) was one of several great American landscape painters who visited Venice, but the only one for whom I have been able to locate a suitable view. 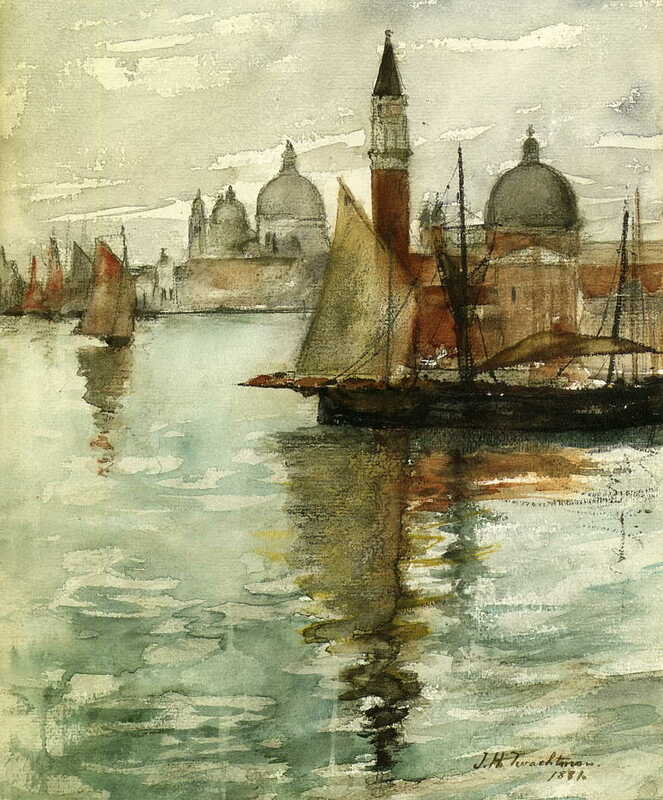 His watercolour Venice (1881) was clearly painted quickly plein air, and shows a view not dissimilar in nature to Turner’s Venice from the Giudecca. John Henry Twachtman, Venice (1881), watercolour, 33.3 x 27.9 cm, Private collection. WikiArt. The lower half of his paper (in the ‘portrait’ orientation) contains only reflections; the upper half is a view from the water which places the Campanile slightly to the right of centre, little higher than neighbouring church domes. Superimposed on that waterfront are passing boats, their sails and rigging complicating the buildings behind. His palette is also limited to earth colours, with grey-blue on the water below. Valentin Serov (1865-1911), Saint Mark’s Square in Venice (study) (1887), oil on canvas, 22 x 31 cm, Tretyakov Gallery, Moscow. WikiArt. 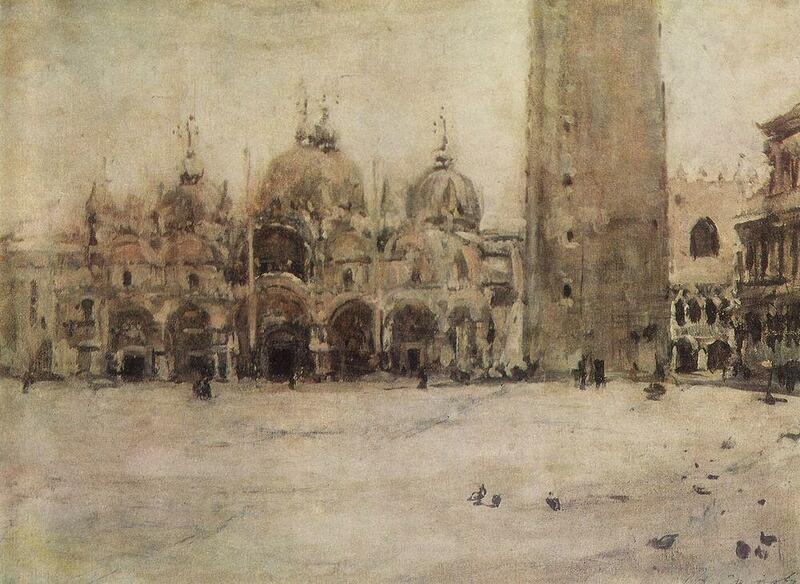 The Russian Impressionist Valentin Serov (1865-1911) painted a study of Saint Mark’s Square in Venice (1887) probably plein air. His composition is the tightest so far, showing the Basilica, the foot of the Campanile, and that south-eastern corner of the Piazza, a closer crop than even Bonington’s. Its brushwork is loose and sketchy in places, as would be expected of a study, and Serov uses mainly earth colours apart from a little blue in the sky. It is not clear whether he made an underdrawing (none is visible in this image), but the five arches forming the front of the Basilica are carefully formed and regular, and the flagpoles in front of them well marked out. Staffage is very light, just a few figures depicted by simple marks. He achieves a lightness with his oils which could be mistaken for watercolour. Franz Richard Unterberger (1838-1902), Rio San Barnaba, Venice (date not known), oil on canvas, 82.5 x 70.8 cm, Private collection. WikiArt. Franz Richard Unterberger (1838-1902) was a landscape painter from the Austrian Tirol who produced many fine views of Venice in a more traditional Romantic style. Although I have been unable to locate any of the Piazza, his Rio San Barnaba, Venice (date not known, but probably around 1895) gives a reasonable account of his approach. The motif is not far from the Piazza, but the tower shown is not the Campanile. Although not as highly finished as the classical works of Canaletto, Unterberger puts great detail into buildings, figures, and other staffage, even down to painting the ties and walking sticks of figures. However fine brushstrokes are distinct over the faces of buildings and in the water, and the clouds display marks more clearly. 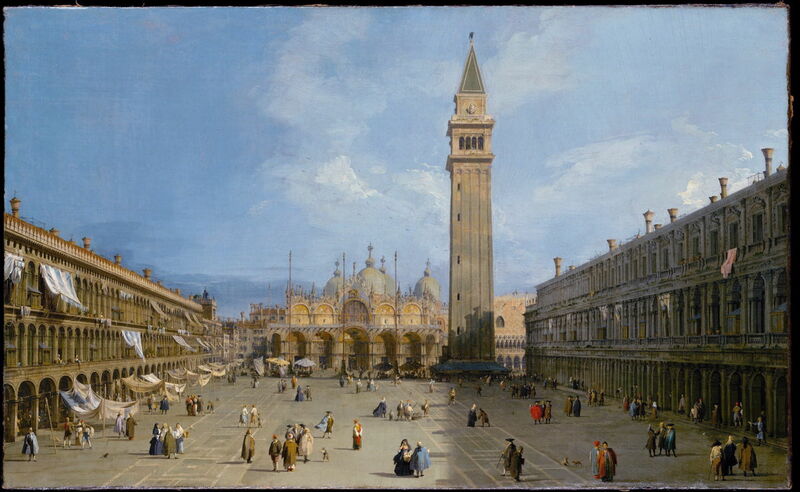 The facture is thus comparable to that in Guardi’s later and looser rendering of the Piazza. His palette is also more conservative than most of the other nineteenth century painters included here, consisting largely of earth colours, with a few small patches of brighter red. Blues and greens are generally low in chroma and not used for contrast. This is also one of the few paintings shown here which looks into the sun, contre jour, which would have been difficult to achieve in front of the motif, given that the sun is also quite high in the sky and intense. However all the indications are that this work was painted in the studio. Together with Jongkind, Eugene Boudin (1824-98) had a special influence over the early development of Impressionism, and took part in the first Impressionist exhibition in 1873, while continuing to exhibit in the Salons. In the 1890s, when his style had become much looser than it was when he was guiding Monet and others in the 1850s, he visited Venice regularly. Eugene Boudin (1824-98), San Marco Square in Venice (1895), oil on canvas, 21 x 38 cm, Private collection. WikiArt. His San Marco Square in Venice (1895) adopts the same view and composition as Renoir’s earlier Doge’s Palace, Venice (1881), although he uses a panoramic canvas with an aspect ratio of 1.76:1, higher than the golden ratio. This ensures that less of the vertical extent of the painting is occupied by uninterrupted sky or water, although the Campanile does not reach to the top of the canvas, and the horizontal centreline is made up of the tops of the roofs, just as in the Renoir. 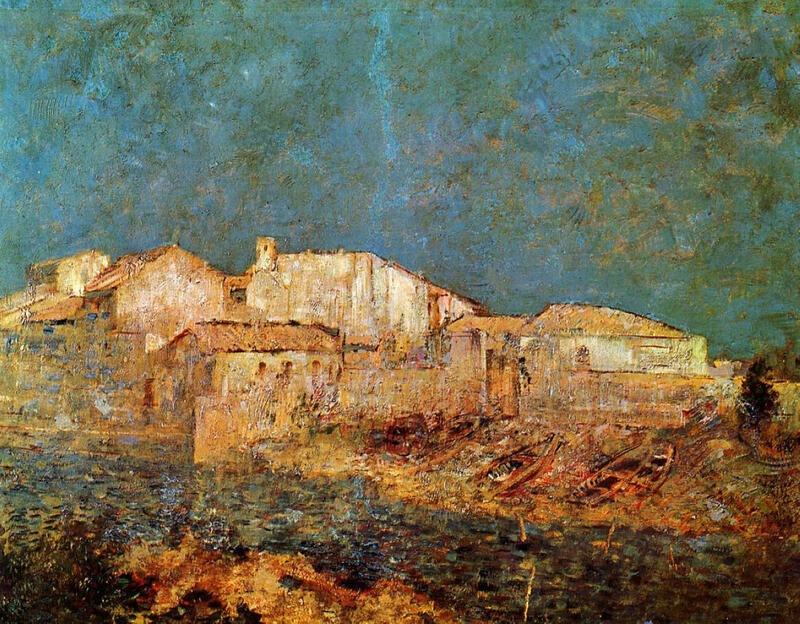 Boudin’s version of this view is more roughly-hewn in its marks, but surprisingly low in chroma, given that it is his earlier work which is usually attributed as showing Monet and others the importance of high chroma. The day is more cloudy, and those clouds are built from coarse patches of white and grey, crowding the sky. Although considerable detail is shown in the buildings along the waterfront, arches and columns are irregular and appear hurried in execution. A few boats are shown in front of the buildings, and a piled structure is at the lower right. The overall impression is of very rapid application of paint, and the work may well have been completed plein air. 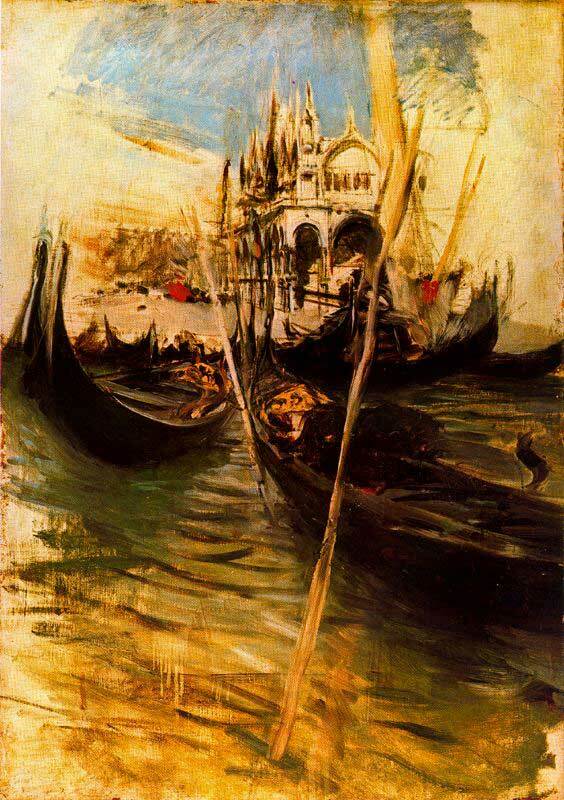 Giovanni Boldini (1842-1931), San Marco in Venice (1895), oil on canvas, dimensions not known, location not known. WikiArt. The Italian Impressionist Giovanni Boldini (1842-1931) was a former member of the Macchiaioli, but by the end of the nineteenth century had become a popular portraitist. His San Marco in Venice (1895) shows an unusual view looking down the Piazzetta from the water to the south, with the ornate frontage of the Basilica. Its close cropping omits any reference to the dominating Campanile (which would have been off-picture to the left) or the Doge’s Palace (off-picture to the right). This tight composition places the centre of view just below the front of the Basilica, drawn in by the forms of the gondolas in the foreground. The water’s edge makes a horizontal line just above the centre of the painting, also drawing the eye in to the centre of view. Only the central objects – the Basilica and gondolas – are fully formed, and towards the edges of the work the paint is applied sparsely and bare ground is visible. Apart from two small patches of red, and a blue window of sky, the painting uses earth colours, mainly at the tonal extremes. Brush marks are left highly visible, and in some parts dilute paint has been allowed to form runs. The whole painting appears to have been executed as a brief sketch, with bravura brushwork and painterly panache. 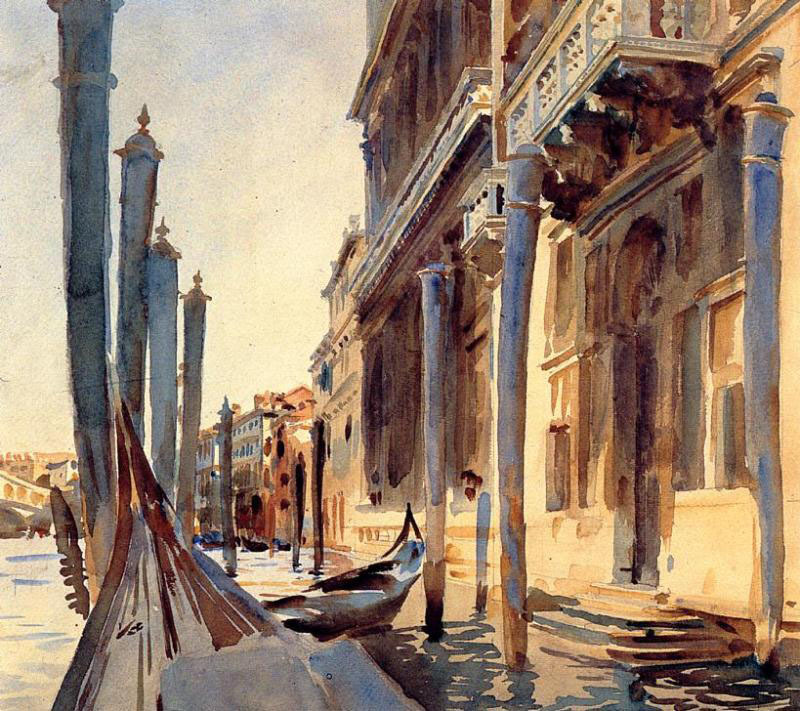 John Singer Sargent (1856-1925) was fascinated by Venice, where he mainly painted brilliant watercolour sketches. Although these and finished oil paintings are numerous, I have been unable to locate an accessible image in which he painted the entirety of the Piazza. More details of Sargent are here, with another account here. 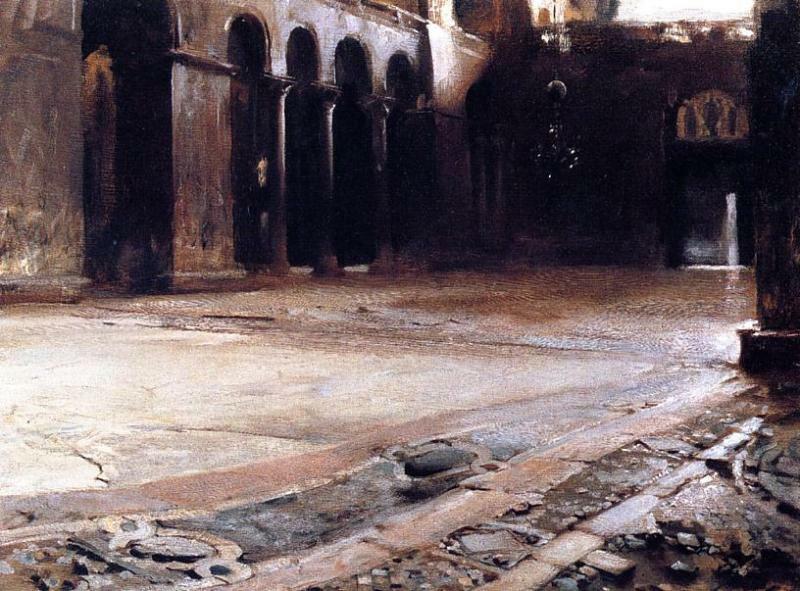 John Singer Sargent, The Pavement of Saint Mark’s (1898), oil on board, 53.34 x 72.39 cm, Private collection. WikiArt. The Pavement of Saint Mark’s (1898) may appear at first to be a puzzling view to paint, but reflects Sargent’s eye for unusual details. The cracked and worn pavement is rendered in almost hyperrealistic detail. 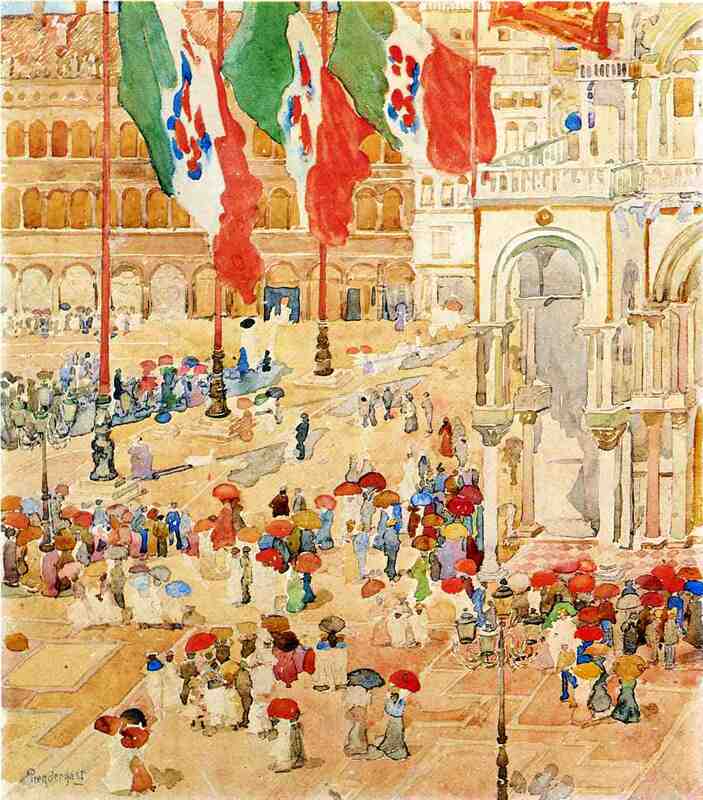 Maurice Prendergast (1858-1924), The Piazza of Saint Mark’s, Venice (c 1898-9), watercolour and pencil on paper, 35.9 x 41 cm, Private collection. WikiArt. The American Post-Impressionist Maurice Prendergast (1858-1924) also painted many watercolours of Venice in the final years of the nineteenth century. The Piazza of Saint Mark’s, Venice (c 1898-9) shows a small scene in the north-east corner of the Piazza, with the facade of the north side in the background, and the Basilica on the right. Another original view and composition, this shows almost no sky at all, and the short shadows suggest that it is set in the early afternoon. The Piazza is packed with people, most shown taking shelter from the harsh sunlight under brightly coloured parasols. His rendering of the buildings is moderately detailed, but lacks the bravura of Sargent. The flags, parasols and clothing add patches of high chroma to the earth-coloured walls and pavement. Paul Signac (1863-1935), Le Grand Canal, Venice (1905), oil on canvas, 73.5 x 92.1 cm, Toledo Museum of Art, Toledo, OH. WikiArt. In the early years of the twentieth century, Venice became an even more popular location for artists. 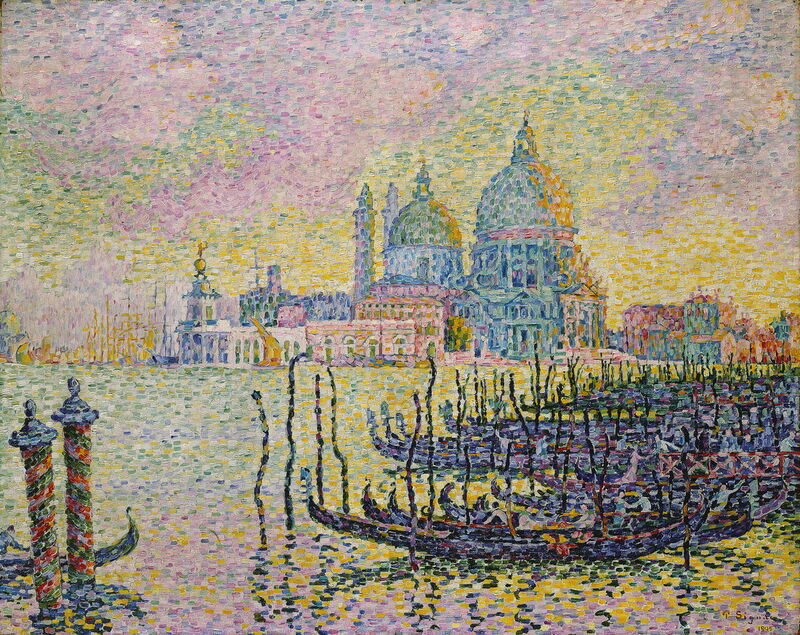 Among the visitors was the Neo-Impressionist Paul Signac (1863-1935), who painted Le Grand Canal, Venice (1905). Its composition is fairly conventional, with the band of buildings straddling the horizontal centreline, a few small boats in front along the waterline. A larger cluster of gondolas is arranged along a diagonal which fills most of the lower right of the canvas, and there are a couple of decorated piles at the bottom left, to provide some balance. As was usual in Neo-Impressionism, the paint surface is composed of small rectangular tiles of colour, arranged so as to encourage ‘optical mixing’ of the colours used. Set at dusk or dawn, the right side of the buildings is coloured gold in the rich light. Within the limitations imposed by the facture, quite a lot of detail is shown in the buildings and boats. Figures are shown in the boats of the foreground, but are difficult to distinguish from the other details. John Singer Sargent (1856-1925), Grand Canal, Venice (1907), watercolour on paper, 40.6 x 45.4 cm, The National Gallery of Art, Washingon, DC. WikiArt. Sargent’s bravura watercolour sketch Grand Canal, Venice (1907) is far from the Piazza, but gives an idea as to his approach and style. It is composed of a sparse, even minimalist, collection of brushstrokes of watercolour which assemble into quite a detailed view of the motif. He views Venice from the level of a gondola, the bows of which are also shown. His palette for these sketches is generally centred on earth colours for the buildings, with blue for the sky, water, and usually the shadows too. 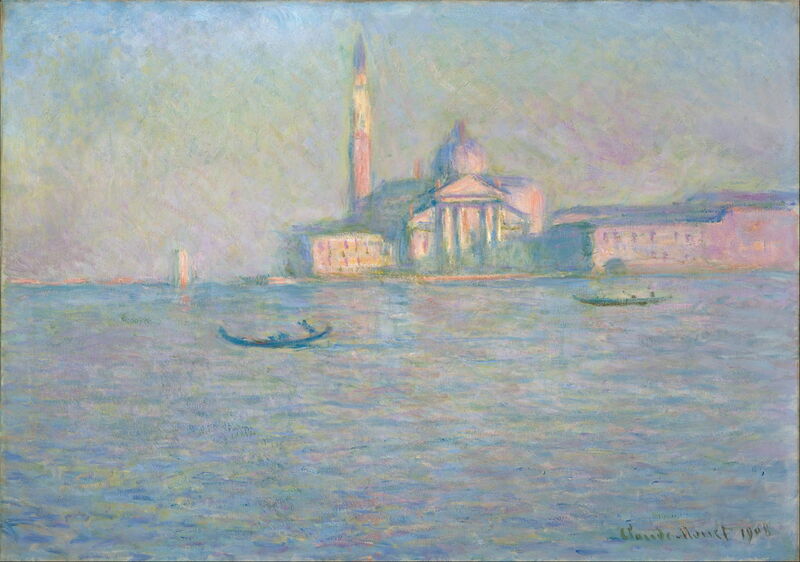 Claude Monet, The Church of San Giorgio Maggiore, Venice (1908), oil on canvas, 64.8 x 92.1 cm, Indianapolis Museum of Art, . Wikimedia Commons. Claude Monet (1840–1926) visited Venice with his wife Alice for two months of painting from 1 October 1908, before he started to have problems with cataracts. 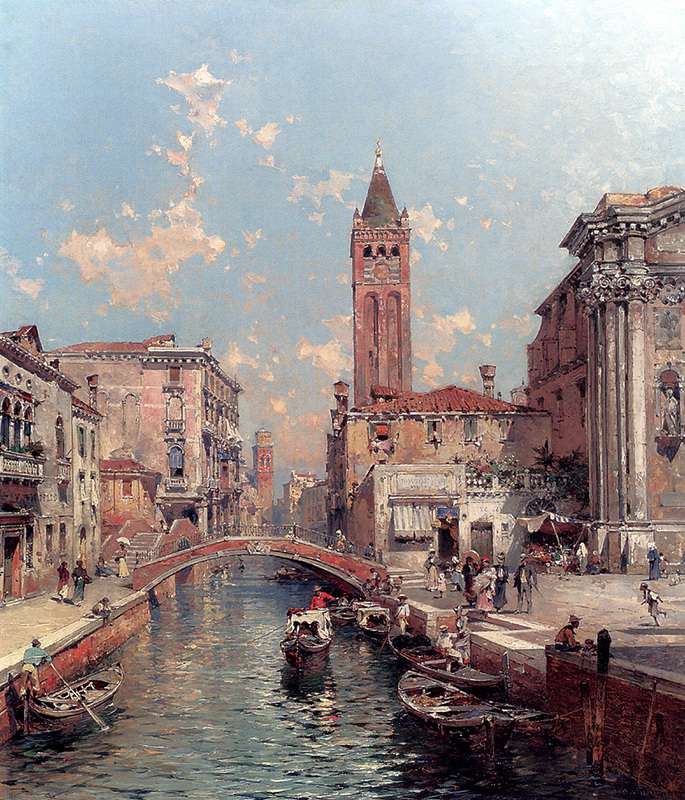 Among the 37 paintings which he started there, The Church of San Giorgio Maggiore, Venice (1908) shows the famous facade of that church with its tower (not the Campanile in the Piazza San Marco) from the Grand Hotel Britannia. He painted six versions of this view, each illuminated by warm afternoon sunlight, and with different patterns of passing gondolas. Each is composed with the line of the waterfront at the horizontal centre of the canvas, so the church and its tower occupy much of the upper half, and the water the whole of the lower half. The sky and water are constructed from multiple orientated brushstrokes of different colours, resulting in oddly indeterminate hues. There is no detail, and the buildings are seen as if in soft focus. Although these paintings were started plein air, and superficially have the appearance of being brisk sketches, Monet spent many months adjusting and refining them when back in Giverny. They eventually went on public exhibition in 1912, the year after Alice had died. 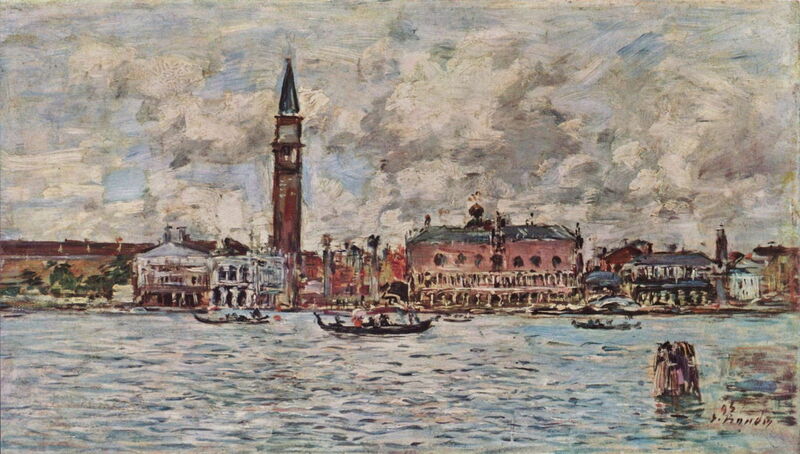 The closest that Monet came to painting the Piazza San Marco was in six similar views of the Palazzo Ducale (Doge’s Palace) with a glimpse into the Piazzetta, and of the Campanile, none of which is currently accessible. 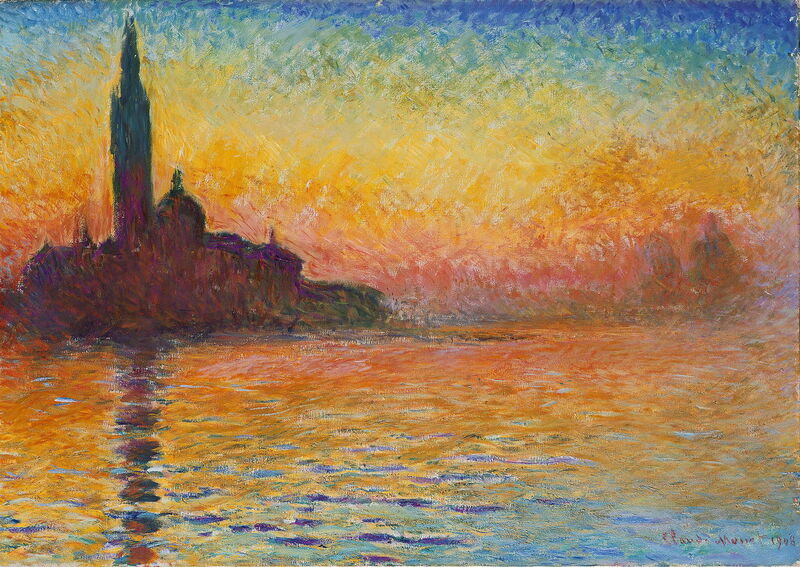 However he did paint a different version of a view of the Church of San Giorgio Maggiore, San Giorgio Maggiore at Dusk (1908). This time, the church is backlit by the sunset, and seen together with its tower in silhouette. This particular version of the motif makes his patterned brushwork clear, as well as the wide range of high chroma colours which he applied. Late in Odilon Redon’s (1840-1916) long and largely Symbolist career, he painted Venetian Landscape, or Fishing District in Venice (c 1908). Although far removed from the Piazza, this shows an interesting intermediate between late Impressionism and more modernist movements in the twentieth century, with their trend towards the abstract. These 25 landscapes by 19 artists have spanned over four centuries of painting, ranging from classical realism to the aftermath of Impressionism. A total of 17 paintings by 14 artists shown above were views of the Piazza San Marco or the Piazzetta, of which only two appeared to have been painted completely plein air. The others showed evidence of quite extensive studio work. The earliest views tended to be the classical, from the western side looking east towards the Basilica and Campanile. However the last of those was painted in 1775, since which views of the Piazzetta from the water (south) have become more popular. Overall there were five classical views of the Piazza, and five of the Piazzetta. More recent views have included close crops which show only a relatively small part of the whole Piazza: there have been four of those in the survey above. Prior to 1775, paintings had a ‘salon’ finish which hid all traces of brushwork; it was Guardi in 1775 who first showed a looser and more painterly approach to marks, and this developed further through the nineteenth century, leading to the patterned brushmarks of some of the Impressionists. Most paintings showing the Piazza or Piazzetta had staffage to add visual interest to the pavement; in a small number of cases the figures and events shown with figures were a major part of the subject. Although many of the paintings had been adjusted slightly from reality, all remain fairly true to the motif. There was though huge variation in the ways in which the motifs have been expressed in paint. That expression is distinctive to the artist, their individual style, and the period when they were painting. Great artists have very individual ways of showing it just as it is. Posted in Painting and tagged Bellini, Boldini, Bonington, Boudin, Canaletto, Corot, Giorgione, Guardi, landscape, Marieschi, Monet, painting, Piazza, Prendergast, Redon, Renoir, Saint Mark's, San Marco, Sargent, Serov, Signac, Turner, Twachtman, Unterberger, Venezia, Venice, vision. Bookmark the permalink. I have corrected the title of Unterberger’s painting from Rio Santa Barnaba to Rio San Barnaba.